Location: Trail begins at the Presque Isle Community Center. The paved trail starts at the Presque Isle Community Center where you can park and visit the library, gardens, cemetery, and other trails. Follow Main Street to the intersection of County Roads B and W. Take Co. Rd. W about ¼ of a mile where you can access the Pipke Park Trail System for a 1.5 mile detour which is disabled accessible around the historic ponds or park your bike and take a 2.8 mile hike along the Wilderness Trail before returning to the Bike Route which continues to follow a quiet road through the woods and bike lanes on the side of the road. The 4.25 mile trail route ends at Wilderness Park and Presque Isle Lake (a great picnic area to enjoy). 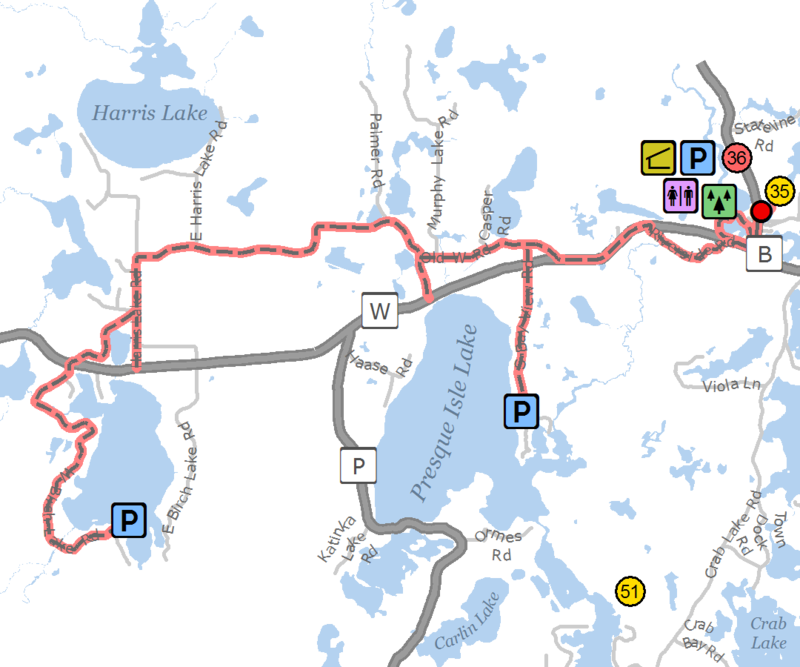 Another 10.5 mile route continues along Highway W and ends at the Birch Lake Boat Landing in Winchester.